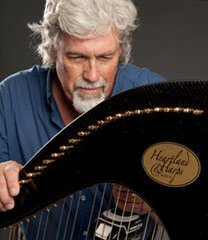 Heartland Harps founder and owner, Dave Woodworth, began building wood harps in 1984, and for the next 25 years, Heartland built more than 1,700 wood harps in a variety of models. In 2001, Dave married professional harpist, Pamela Bruner. Pamela did the hand-painted artwork on the wood harps and, with her help, the design and sound of the harps continued to evolve through the years, including into new materials like carbon fiber. In 2009, Heartland fused the art of harp-building with cutting edge technology and introduced our first harp model fabricated from carbon fiber—creating a harp that is lightweight, impermeable to the elements, and virtually indestructible. To date we’ve built nearly 1,000 carbon fiber harps for delighted customers all over the world. Most recently, Heartland Harps is expanding. Our team is growing in both service and production areas, bringing on a new generation of talented harp builders. We’ve also recently opened a state-of-the-art carbon fiber fabrication facility just outside Asheville, North Carolina. We feature three lever harp models—the 36-String Legend, 38-String Delight, and 36-String Infinity travel harp. In addition, we also offer the Starlight, 47-String Concert Grand pedal harp. These harps are are making a difference in how and where harps are played around the world. We look forward to talking with you and building the harp of your dreams!